International-Curricula Educators Association is an international NGO promoting education for sustainable development and global citizenship. 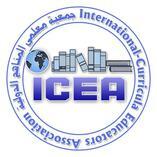 ICEA was incorporated in Egypt 2008, registration No. 7451, and is now operating from the United Kingdom. ICEA is a country winner of the Educating Africa Award, 2011 for entrepreneurship in education, an accredited for Rio+20 (World Earth Summit 2012), an affiliate practitioner to the Forum UNESCO University and Heritage. ICEA now works in coordination with several companies and NGOs worldwide to advance environmental protection and promote global citizenship.